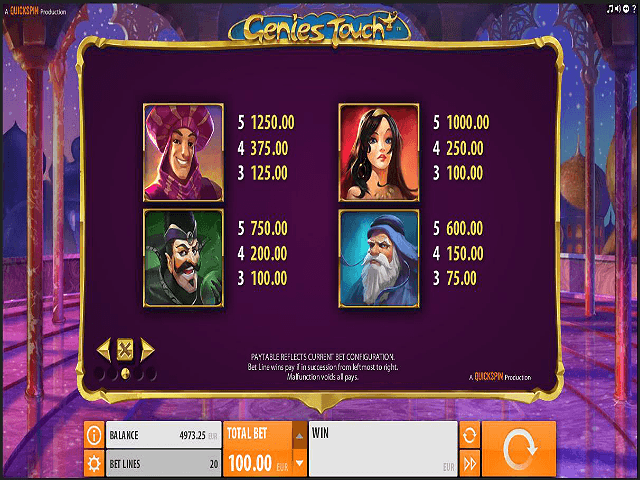 The genie can make your wishes come true in this five-reel, 20-payline video slot from innovative developer Quickspin. In this graphically impressive slot, the genie appears to turn symbols into winning combinations, while there are also free spins and wild symbols that can further boost your riches. 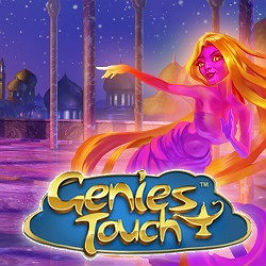 If the genie is tempting you, then read on to learn all about how to play Genie’s Touch and the different features in this magical game. Exotic cultures are one of the staple themes of online slots, which Quickspin has adapted with gusto here. 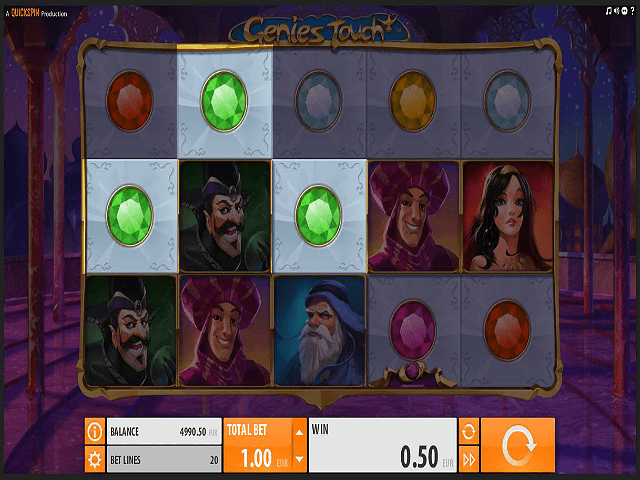 Based on a Middle Eastern theme, you can’t help but be reminded of Disney’s Aladdin when playing Genie’s Touch. The graphics are excellent in this game, with the reels set against a beautiful backdrop of ornamental columns and towers. This is complemented by a mystical theme tune, while louder sounds accompany the special symbols. When it comes to betting, Quickspin has kept it simple with a fixed number of 20 paylines and no bet levels. All you have to select is your total bet, which can be as little as 20p or as much as £100. If you want even faster play, you can press the fast forward button on the bottom menu, which will speed up the spins. The four unnamed characters are the high-value symbols on the reels, including the Aladdin-like figure who pays out 12.5 times your stake if you land five. The six jewels of different colours are lower-ranked symbols that don’t offer any huge returns. As the title suggests, it’s all about the genie in this game. Landing three or more of the magic lamp symbols triggers the Genie Touch feature. The genie will appear out of the lamp and turn adjacent symbols, including the magic lamp symbol itself, into matching symbols. What’s more, she will always pick the best possible winning combination to give you the biggest win. This feature triggers fairly frequently and if you get a winning combination with the high-value symbols, it can deliver some handsome wins. There’s also a Free Spins feature, which is triggered by landing three of the Bonus Scatter symbols anywhere on the reels. You’re given ten free spins and extra magic lamps are added to the reels, boosting your chances of winning. This feature doesn’t tend to occur as frequently as Genie Touch but it’s here where the big wins are most likely to come. Lastly, there’s a wild symbol to look out for. This symbol, which is simply a gold box with the word ‘wild’ in it, substitutes for all symbols other than the Bonus Scatter. You’ll get paid 25 times your stake for landing five of them, while three of them will reward you with 2.5 times your stake. 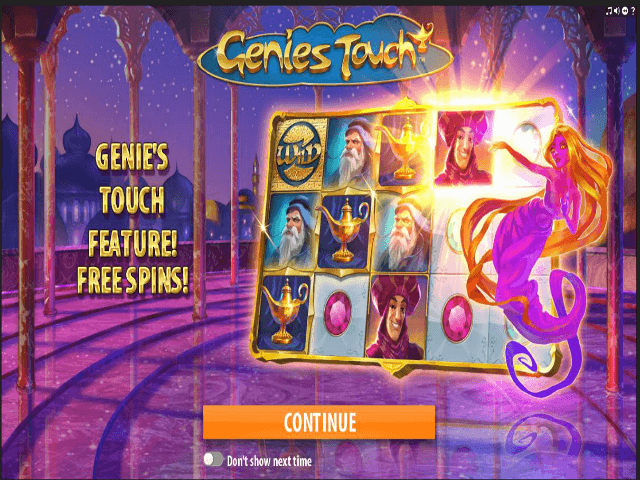 There’s not a huge amount to Genie’s Touch, though it’s a nice, simple slot game with high-quality graphics and sound. Even low rollers can score some decent payouts from both the base game and the Genie Touch and Free Spins bonus features. 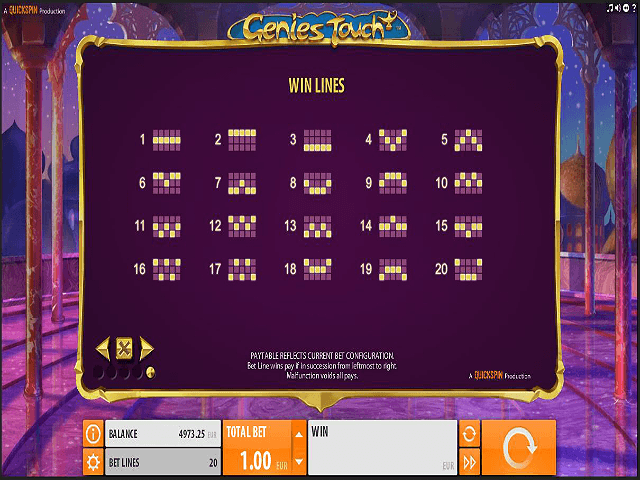 If you like Genie's Touch - You'll like these slots too!